The Department of Science and Technology tied-up with Nanyang Polytechnic International (NYPi) and Temasek Foundation Inc. (TF) to train food control, food safety monitoring, food safety specialists and food testing experts and officials in Singapore. The following agencies: the Department of Science and Technology (17 Regional Offices and 3 attached agencies -DOST-PCIEERD, DOST-FNRI, DOST-ITDI), Department of Health (DOH), Food and Drug Administration (FDA), Department of Agriculture - National Meat Inspection Service (DA-NMIS), National Food Authority – Food Development Center (NFA-FDC) sent representatives to Singapore from year 2016 to 2017 in a batch- per- batch sequence to undergo the Food Safety and Technology Program. NYPi and TF demonstrated innovations on food testing – microbiological and chemical- at the food testing laboratories in Nanyang Polytechnic's School of Chemical and Life Sciences. Through observation tours and discussion meetings with the experts from Nanyang, the experts and officials acquired the scientific basis for integrating and harmonizing effective approaches and workable strategies in strengthening the national food safety control system. Over this period, 160 officials and staff have completed the training at different levels in a total of eight (8) batches. Under this Philippine Singapore partnership, the BCDA (Bases Conversion and Development Authority) through PCIEERD (Philippine Council for Industry, Energy, and Emerging Technology Research and Development) had provided the Philippine counterpart funds, while TF and NYPi have provided the Singapore counterpart. The total project cost P 15M fund and contribution from DOST. Among the other targets attained in this program were the international collaboration and networking on food testing and analytical tools; effective collaboration and mutual support among all the agencies and Singapore partners; and an actual action plan with advocacy strategy and policy formulation on all aspects of food safety currently implemented at the national, regional, provincial and municipal level within nine (9) months after the training. DOST with other agencies intends to strengthen the assistance to food MSMEs through consultancy and laboratory testing so they can comply with the international standards. The actual outcomes of the programs and its effect on food safety concerns nationwide will be presented to the media on October 24, 2017, at the Manila Hotel, One Rizal Park, Manila. NYPi is a well-known training institution worldwide on all aspect of innovation and enterprise. It has Teaching Factory concept to train technologists, innovated constantly to meet the needs of a changing economy, worked closely with partners in industry and focused continually on developing new capabilities. Temasek Foundation is a Singapore philanthropic organization that seeks to build a more prosperous, stable and connected Asia through building human and social capital. 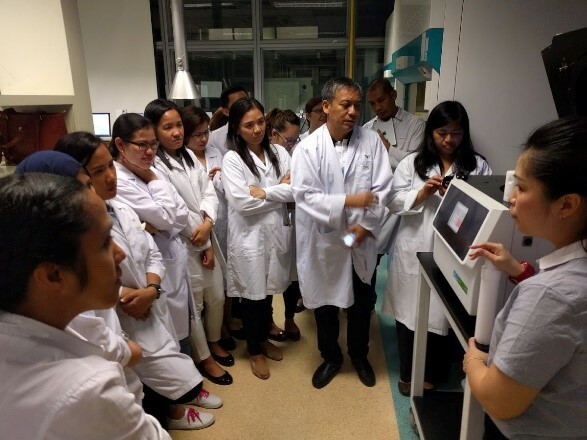 Temasek worked with NYP to support the Training program on food safety which assists in the improvement of the Philippine food control system that in the long run, improves the health and quality of lives of the Filipino people.